Introduce* the content of the syringe* into the petrol tank before fueling. Fill the tank with fuel. * It is recommended preliminary to dissolve the content of the syringe in a small amount of oil (20-30ml) at its temperature of exceeding +25°C. 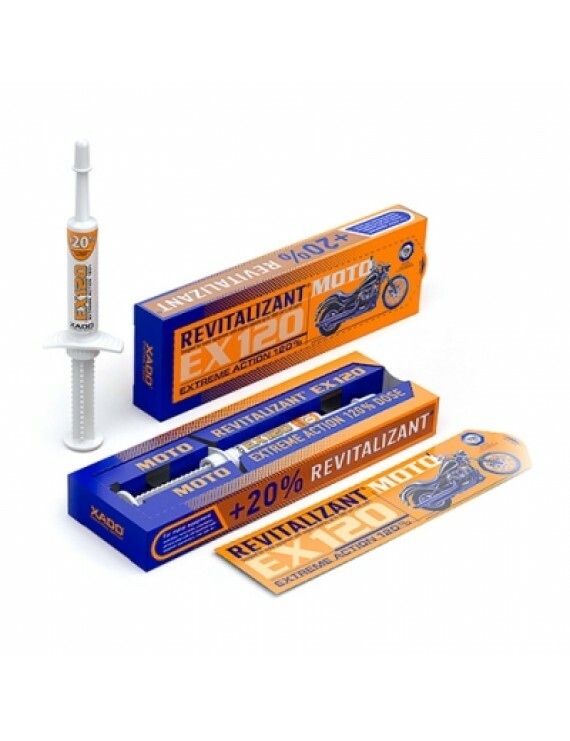 Revitalizant EX120 MOTO is designed for antiwear protection, restoration and protection of engines of motor equipment with combined or separate lubricating system with capacity up to 1000 cm³ (for motorbikes, motorcycles, snowmobiles, personal watercrafts and household motor equipment, etc.). Products is applied to motorcycles, motorbikes, snowmobiles, personal watercrafts and household motor equipment, lawnmowers, chain saws etc. Due to its by 20% greater* active agent’s concentration, Extreme Action 120% (EX120) Revitalizant possesses extended potential of worn surface restoration and antiwear protection. * compared to XADO MOTO.